Our pier is mole number 11, where you will find the sailing yachts from our yacht charter fleet (see marina layout, yacht piers are marked with an arrow). 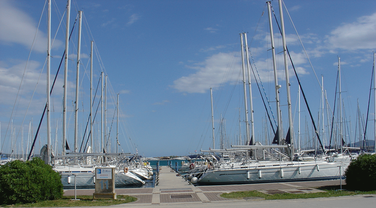 Most of our yachts are at Nautic Adria pier 11. Some of our yachts are also at pier number 18. Nautic Adria yacht charter base is in Croatia, Sukošan (Bibinje near Zadar) in Marina Dalmacija, located opposite pier number 13. You will find our office in the building opposite pier 13 (see also marina layout). 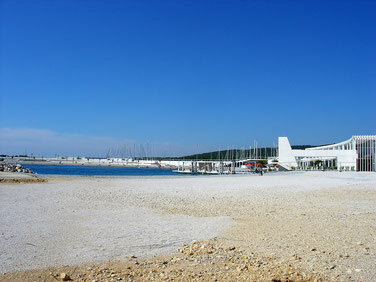 Marina Dalmacija is located along the main coastal road, also known as Adriatic highway, about 9km SE of Zadar. Marina Dalmacija is artificially constructed and where now the greater part of the coast and the peninsula is, 25 years ago there was sea. 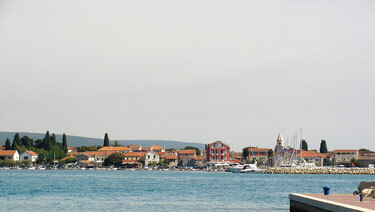 It is the largest marina in Croatia and on the east coast of the Adriatic Sea. The marina is very impressive as a product of a human. Along the coast there are plenty of parking spaces, nevertheless the Marina Dalmacija offers a lot of open parking spaces (charged per day/week!) and payable garage spaces. The marina has several shops, restraurants and cafes, enough toilet facilities, a front desk and general store, as well as a gas station. 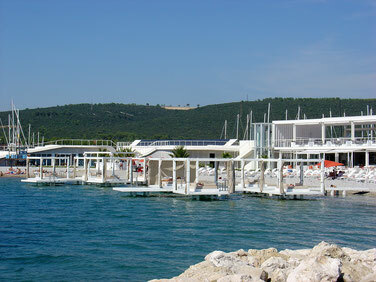 Marina Dalmacija is located between Bibinje and Sukošan, with only a few additional external supply services. Major shopping centers are located about 6km away, on the outskirts of Zadar. Along the coast, at this part of the Adriatic Sea, three island chains are stretching. To the nearest, Ugljan and Pašman, are only a few miles, and the Kornati islands are 11 miles away. It is important to note that through the Ždrelac channel between the islands Ugljan and Pašman, sailboat navigation is possible only for sailing yachts with up to 16,5m mast height above the water level. Sail boats able to pass the channel are yachts about 12m long. Yacht charter base Sukošan represents an excellent starting point for cruises in an island rich part of the Adriatic Sea, as to the SE and NW. There are several small shops and cafes in the marina as well as the restaurant, café, beach-bar "Portus" - which lies on the peninsula next to the beautiful marina beach. Marina Dalmacija has its own beautiful private beach. The beach is in form of a crescent and streches aross the water, nearby, and around the bay and several miles away on the other side.